Through the eyes of an adult, a bed is a spot to rest, a refuge for sleep and a place to recharge before work the next day. 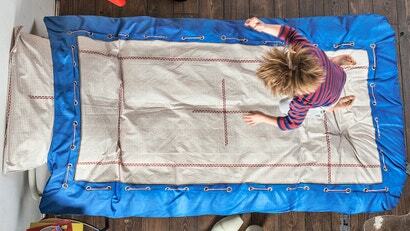 But to a kid a bed really only has one useful purpose: as a trampoline. And since jumping on the bed is rarely allowed, Snurk made this wonderful matching quilt cover and pillowcase set that turns any mattress into a bouncy playground. Printed with a high-res image of a professional trampoline, complete with a big cross-hair in the middle so kids can stay on target, the $80 set is at least a way to easily tire out your aspiring gymnasts. It does come at the cost of a perfectly good mattress, but who cares if it means your kids actually sleep through the night for once?